Line profiles of the krypton spectra emitted by the plasma of current sheets are simulated. Current sheets are formed under the impact of magnetic fields with singular X-lines. The spectral line profiles are calculated by the method of the energy matrix diagonalization of an atom in an electric field. 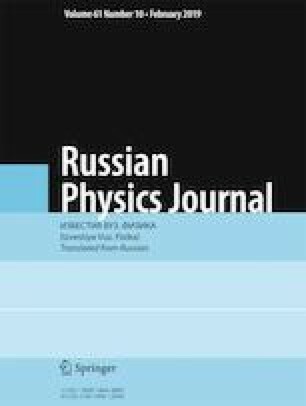 The dependence of the behavior of the line profiles on the parameters of an alternating electric field arising inside the plasma of current sheets and the dependence of these profiles on the plasma temperature are investigated. The criteria which allow one to reveal spectral lines serving as the indicators of the appearance of anomalous electric fields inside current sheets are suggested. Translated from Izvestiya Vysshikh Uchebnykh Zavedenii, Fizika, No. 12, pp. 113–120, December, 2018. A. Kramida, Yu. Ralchenko, and J. Reader, NIST Atomic Spectra Database (ver. 5.2) [Online], National Institute of Standards and Technology, Gaithersburg, MD, URL: http://physics.nist.gov/asd.